That sounds truly amazing!! Interesting that the country is made of such a diverse group of people who have in turn incorporated their cultural practices into the main culture. In a class I am taking the term “authentic” in terms of practices and culture, it appears that this is not something that really exists there. Hmm, it seems mighty old school and traditional to have a whole group of people sharing one relatively small cup/drink. But then again, that likely adds to the speciality and closeness of the practice. It sounds like that drink is their version of what many Americans make themselves consume– drinks that are often not actually tasty, but the nutrients involved are incredibly healthy– except Paraguayans probably genuinely enjoy the drink, not to mention the quality time spent with family and friends. Terere sounds fairly customizable too, do you think the average American could make it bearable by adding lots of sugar and artificial sweeteners, or are the flavors too powerful? I find it fascinating that a young person is in charge of holding the jara. How many people usually sit together to drink terere? I think this sounds like an amazing way to spend time together, it reminds me of what many families in America do during their dinner time. What poha ñana is your favorite? Thank you for writing about such an interesting tradition! Would you perhaps say for young people participating in this ritual is also a kind of “right of passage”? I wondered because you mentioned that if a young person was allowed more than a drink or two then it indicated that the adults noticed a sense of maturity in the young individual. I liked that you mentioned the importance of not rushing and enjoying moments in Paraguayan culture and how that related to the Terere tradition. To me it sounds quite different from American cultural traditions, which tend to involve quality time with loved ones, but are often rushed. Very interesting article! I found it very interesting how the act of drinking terere was so built into the culture of the Paraguayan society that it is followed so precisely. What really caught me was how each person has their own type of way to make terere, but if you don’t like that way you should still be accepting and never try to change it. Also how they use it as a way to show maturity was really interesting. What’s your favorite way of drinking terere? Great Article! What an interesting article! It is also fascinating to learn about a tradition that has become part of the very culture of the country. It was very fascinating to read about Terere and how each person has their own way of drinking it and the respect behind when someone else makes you terere. Also the connection it has with maturity follows the pattern of many traditions. What is your favorite way to drink terere? Great Article! You did such a beautiful job explaining the social tradition. 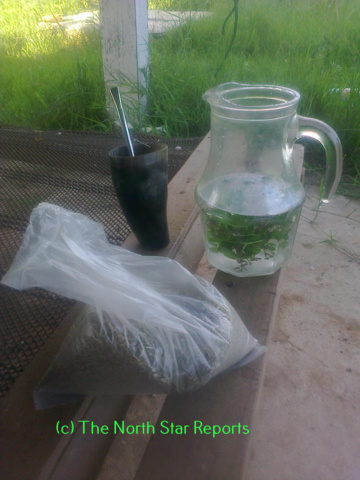 Seemingly small acts, like sharing the terere, are very crucial to developing and supporting a person’s cultural sense. I think it’s wonderful that younger people can participate with such a strong role, such as holding the jara. It can develop and build off of many cultural values. Sharing the time with those you are close shows the importance of relationships in Paraguay culture. That sounds like an amazing way to bring about a closeness in a family. I also like that you described how important of a tradition it is by telling how and why each item used for the drink. It seems a whole lot more meaningful to be growing up with a tradition like that one. It is also fascinating to know that such a tradition can be so beneficial to them. A shared and social tradition like this — usually over food or drink — seems common no matter the location. I think it is safe to say good food and drinks bring people together. The description you provided about the societal relations at play was interesting, too. It’s forcing me look at some of the United States’ own rituals more critically. What do they reveal about what we value (or don’t value)? I find this article very interesting because in a way it can be related to our American culture in a less spiritual way. We choose to spend our time with loved ones sitting in a bar or having a drink somewhere. Although you made it very clear the tradition of Terere is much more sacred, I think it’s fun and interesting to compare it to our customs as well. I like that their “drink of choice” is healthier and can heal ailments compared to our alternative. This sounds like an amazing experience to be there and being able to observe this wonderful cultural practice. You did a wonderful job of pulling in the details that made me feel that I was almost there passing the terere with others around me. I think what’s important to highlight is that young people are able and are still participating in this tradition. It’s truly a beautiful thing to know that cultural practices such as this one are still being passed down and shared with younger generations. Food links us all together in some way. It is always very cool to see how food contributes to different cultures. Drinking Terere sounds like a very important experience and has more meaning to it than most things I do in my regular life. Thank you for sharing your story! Wow what a cool article. The idea of defining a group of people not through geographic location or language or religion, but through a common daily practice is interesting in many ways. When everyone in a community takes time in their daily lives to drink a special drink then it appears that everyone benefits and gains something from it. The particular practice of accepting young people into a social circle is particularly interesting. The dietary habits of groups of people around the world are fascinating and say much about a local culture as food is so central to culture. I had no idea that Paraguay was considered a bilingual country with Spanish a Guarani. I feel like mate is often discussed in Spanish language courses in the States, but it is often discussed in relation to Argentina. I had no idea that it was such a big part of the culture of Paragua, or that the ritual of terere is so heavily influenced by Guarani. I assume that a large amount of the practice has Guarani influences based on the words? Ka`a and mbombia don`t sound quite like Spanish, but mbombia seems very similar to bombilla, which is what I was always taught was the name for the straw. This was such an interesting post! I enjoy learning about traditions that are meant to bring people together and have special cultural significance. The fact that it defines the group who participate in the ritual as well. I wish there was something with even slightly the amount of significance with my family/culture! I would love to try some of this tea, maybe one day I will make it down there to try it! This post really goes to show how important traditions are to an identity. Your final sentence exemplifies this by saying they are so newly free that there is no single aspect to identify them as a group besides drinking this. This article was really interesting to see how food/drink items can really unite a culture and give them some kind of an identity. My Spanish teacher in high school was from Argentina, so he brought in mate for us to try. It sounds just like terere from the way you described it. We gathered in a circle and told stories the whole class but we each had our own cup. I’m curious to know if you liked the terere? I found that I didn’t like the mate really at all. This is a very interesting aspect of the culture there! I always find it so fascinating how intricate and precise methods of doing things find their way to becoming a large aspect of the culture in a country. I’d be interested learning how the younger people are included (or excluded) in other aspects of the culture. Taking the time to enjoy quality time with family and friends is something that almost seems lost in this fast pace technological age. I have heard of this social ritual back in high school, when one of my friends’ purchase all of the utensils and ingredients from his Spanish teacher to try for himself. He was a wrestler, and said it helped him out mentally. Now, whether it did physically that I have no clue. It was nice to get a better background of the social ritual. Great article!